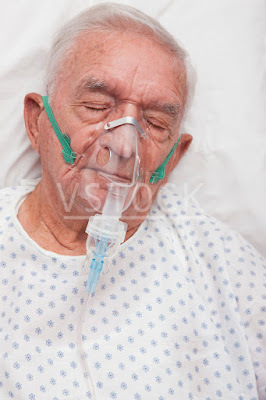 If a patient is unable to oxygenate appropriately on room air, supplemental oxygen may be indicated. This Course should provide you with the wisdom you need to determine what oxygen device to use (if any) and how much oxygen to give to your patient. Supplemental oxygen: Any device that provides more oxygen than what one would get breathing room air. PaO2: This is the level of oxygen in the blood. It’s obtained by invasive Arterial Blood Gas (ABG). SpO2: It's a measure of how saturated hemoglobin are with oxygen. Be aware that a person’s normal SpO2 decreases with age, while sleeping, and with some disease processes. The only way it can get to 100% is with supplemental oxygen. 4-5-6-7-8-9-Rule. Allows you to use SpO2 to estimate PaO2. Therefore, ideally, for most patients, you will want the SpO2 to be 90% or greater, or as specified by hospital protocol, or specific physician order. Fraction of Inspired Oxygen (FiO2): This is the percent of oxygen a patient is inhaling. Room air FiO2 is 21%. By applying supplemental oxygen, the FiO2 can go as high as 100%. Low flow oxygen devices: These are oxygen devices where some room air will be entrained, and therefore the exact FiO2 cannot be calculated, however it can be estimated. 1. Nasal Cannula: The nasal cannula is the most common oxygen device used and the most convenient for the patient. A nasal cannula at 2lpm is usually a good place to start. The liter flow on a nasal cannula should never exceed 6lpm, as studies show doing so is of no added benefit to the patient. Also note that the prongs of a nasal cannula should face down. A bubbler can be added to humidify the nose to prevent nasal drying and bleeds. This is automatically set up at flows greater than 4lpm, or as ordered by physician. 3. Non-Rebreather Mask (NRB): This is a mask that ideally will bring in 100% Fio2 so long as the liter flow is 15 and there is a good seal between the mask and the patient's face. And all three one-way valves are on the mask to prevent air entrainment. For legal purposes, however, one flap is always removed just in case the oxygen gets shut off. And therefore the highest FiO2 you can get from an NRB is 75%. The bag acts as a reservoir for oxygen, and therefore allows device to provide higher FiO2s to the patient. 4. Partial Rebreather Mask (PRB): This is basically an NRB with both one-way valves removed from the mask. The estimated FiO2 is 60-65%. Flow should be set at 6-15 lpm. High Flow Oxygen Devices: These devices meet the inspiratory flow of the patient, and generate accurate FiO2s so long as there is a good seal between the mask and the patient's face. The flows are such that the patient will not be entraining room air that will lower the FiO2. Respiratory rate and tidal volume of the patient have no effect on FiO2 delivered. Ideally, the larger the entrainment port on the device the lower the FiO2, and the smaller the entrainment port the higher the FiO2. A major disadvantage is a mask is required, and this may be a bit more uncomfortable than a nasal cannula. 1. Venturi Mask: This mask is ideal for patients who are in respiratory distress with high tidal volumes or high respiratory rate to guarantee a certain amount of oxygen. If a nasal cannula does not provide adequate oxygenation, Venturi Masks set from 28% to 40% are ideal for COPD patients. Modern Venturi masks come with one or more color coded caps, and whichever one you use the desired liter flow for that particular cap is written right on the cap. The liter flow must be at least set at the recommended liter flow for any particular FiO2 that is dialed in. It's okay if it is set too high, yet if it's too low the patient may retain CO2 and the FiO2 may not be lower than what you dialed in. Usually a humidity device is connected to the flowmeter, and wide bore tubing connects this to the patient's mask Wide bore tubing acts as a reservoir to obtain higher FiO2s. These are ideal for patients with tracheotomies because it allows for inspired air to be oxygenated, humidified and even heated if necessary. They can be hooked up to a simple mask, tracheotomy mask, and even a t-piece. The flow may exceed the required flow, although if it is less the patient may retain CO2, and the FiO2 be lower than desired. On inhalation a mist should be seen coming from mask or reservoir. 3. High flow nasal cannula: An Fio2 of 21% to 100% may be maintained because the flow meets the patient's spontaneous inspiratory demand. This is made possible due to thicker tubing and humidified oxygen. 1. BiPAP: This is a discussion for another day. Still, pressure can be given by a non-invasive mask over the patient’s face to improve ventilation, and to supply any FiO2 from 21% to 100%. These also have other means of improving oxygenation. 4. Ventilator: This is also a discussion for another day. Yet for patients whose oxygen demands exceed any of the above devices, intubation and ventilation with a ventilator may be required. These can supply any FiO2 from 21% to 100%, and also have other means of improving oxygenation. Oxygen may suppress the respiratory drive for some COPD patients, and should be used with caution. FIO2s greater than 60% for greater than three hours have been linked to increased risk for lung injury and other future consequences. What device do you use? Where to start? We usually start at 2lpm for most patients and adjust accordingly. If you have a patient in respiratory distress, you may want to start at 40%. All patients suspected of chronic heart failure should be placed on 100% FiO2 and adjusted down from there. All patients who are suspected to be CO2 retainers should be started on 2lpm or, if in respiratory distress, on a venturi mask set no higher than 40%. Still, a majority of patients do quite well on 2lpm. How much oxygen does a patient need? Ideally, whatever oxygen device is needed to maintain a SpO2 of 90% or greater or as otherwise specified by a specific oxygen protocol or physician order is indicated. Oxygen supplementation for uncomplicated acute coronary syndrome is no longer routinely indicated and should only be applied only if the oxyhemoglobin saturation is less than or equal to 94 percent. The old recommendation was to place all patients complaining of chest pain on 4lpm with the belief that it would increase oxygen to the heart and decrease work of breathing. I'm simply noting this here because some physicians prefer to stick with the old recommendations, and that's fine. Sedatives, analgesics (like Morphine) and anesthesia may also depress respiratory drive, and these patients are often placed on oxygen. The amount used is usually 2-3 lpm via nasal cannula, however this depends on the patient, physician, or protocol. How long with an e-cylinder last? Getting ready for my boards, would you ever connect a partial rebreathing mask to humidity? About the only time I ever saw them used during clinicals was in the ED and they didn't stay on long once true O2 needs were assessed. You technically can use a humidifier with a partial rebreather, although it's not generally recommended. The general rule for oxygen therapy is to maintain an SpO2 of 88-94%, depending on your patient (with COPD patients being in the low range). They can be used anywhere in the hospital setting, although a common location is the ER. As a clinical instructor for junior level respiratory care students, I find this information to be a great resource for learning basic oxygen therapy concepts. Thank You!